30 teams of three plus a celebrity golfer play in the competition on the Pestana Vila Sol Championship Course that has twice hosted the Portuguese Open. Previously filmed for broadcast on Sky Sports this has become a favourite tournament with many celebrities from the worlds of football and entertainment who come and give their time to celebrate Sir Bobby’s life. The format is a practice round on Friday followed by the stableford tournament on Saturday morning on the closed course. Best two scores count off full Golf Club accredited handicap. Lunch on the Golf Club Terrace for the teams follows Saturday’s round. 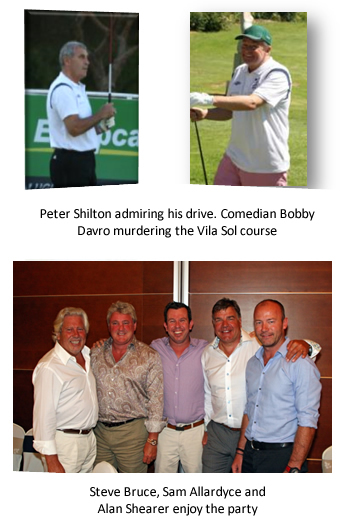 Gala Dinner with prize giving, Auction and Cabaret in the Pestana Vila Sol Atlantico Ballroom. Buggies provided on Friday and Saturday. Beverages provided with Saturday’s luncheon and at the Gala Dinner.